The Hurricane from Field Logic has something for everyone. One side of the target will get you ready for an upcoming competition, while the other will show you exactly where to aim when you are hunting deer and other large game animals. The durable construction ensures that this target will keep its shape through multiple hits, and you will also love how easy it is to see at a distance. Designed to improve aim and accuracy, any archer can benefit from using this target. The main issue with this target from Field Logic is the design. While it does come with graphics on both sides, the images for the vital organs will be upside down. The target can be flipped if it is sitting on a stand, but this could be a problem if it is hanging from a rod or branch since the metal rings are only located on the top of the bag. You want to make sure that the target you choose is designed to last through repeated arrow hits, and this is not a problem with the Hurricane. The sturdy core will effectively stop field points at speeds up to 300 feet per second, and it is also designed to make it easy for you to remove the arrows when you are finished. The outer covering protects the target from moisture and weather exposure, and it is securely fastened with metal staples to ensure it will last for years. Featuring “Tri-Core” technology to ensure long lasting performance, this bag target might be exactly what you are looking for. If you want to improve your aim and accuracy at a distance, you need to be able to see the target. 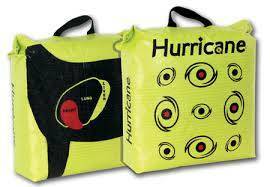 The neon green cover ensures that the Hurricane is clearly visible, and also make the black targets easy to aim for. You will appreciate the convenient handle that makes it easy to carry the target to the practice field, along with its relatively lightweight construction. There are two metal ringed holes at the top of the bag so you can hang it from an elevated stand, or simply set it on a fence. This bag target also comes filled so you can start using it right out of the box. You can easily improve your aim with this bag target from Field Logic. The front of the bag features round targets so you can get ready for the next competition, and you can also practice for this year’s deer season with the vital organs printed on the back. The bright green color ensures that you can clearly see the bag from a distance, and it also comes with a durable construction that is designed to withstand repeated hits. Perfect for beginners and experienced pros, it is easy to see why the Hurricane remains a consumer favorite. Check our buying guide to find the best archery target for your needs.